Lodging can be one of the biggest expenses of a family vacation, and we like finding a good budget hotel where we can afford to stay longer and travel more often. When I learned that Extended Stay America offers complimentary full kitchens, breakfast, Wi-Fi, laundry facilities and more, I was eager to try it for myself. We had plans to visit the Festival of Trees in Sandy, Utah that weekend, and saw that Extended Stay America was nearby. We booked a studio suite with two full beds on short notice and packed our bags for the night. We were wowed by the size of our room – noticeably larger than the average hotel room. The front desk clerk was kind enough to show me a few of the other rooms, and not every room had so much floor space, but the 1 bedroom king bed and sofa sleeper room was about as large as our 2 full beds room. I found that “1 bedroom” means that there is a half wall between the king-size bed and the rest of the room. In addition to two full beds, we also had a sofa sleeper, which gave my family of four space to spread out. The paint and carpet in our room was new, and our room was clean. The bedding and furnishings were basic, but comfortable. All rooms had flat screen televisions and a selection of cable TV channels. All rooms were non-smoking. I loved the floor space in our bathroom, but would have liked to have more counter space. Your dog or cat will be welcome in your room for an additional fee. If you will stay more than one night, be aware that Extended Stay America does not provide daily housekeeping. They will exchange towels at the front desk when you need them, and provide cleaning supplies. They will clean your room once each week unless you would like to pay for more frequent service. Your room will be fully cleaned before you check in. I wished that the full-size beds were queens, but overall, we were happy with our experience and would stay at Extended Stay America again. For less than $100/night, I felt that we got a lot of bang for the buck. Preparing your own meals is a great way to keep costs down on a family vacation, and every room at Extended Stay America has a full kitchen. This includes a full-size refrigerator, microwave, stove top, sink, counter space and cupboards. It’s compact, but would easily allow a family to prepare simple in-room meals. Extended Stay America offers online recipes and a downloadable cookbook with lots of meal ideas at www.awayfromhomecooking.com. Extended Stay America offers a variety of my favorite family amenities, in addition to the full kitchen. These include a complimentary breakfast, Wi-Fi and laundry facilities. Some hotels in the chain offer a shuttle, fitness facilities, pool and hot tub, but the Sandy location did not. You are also eligible for the Extended Perks program when you stay at Extended Stay America. We received coupons for restaurants, rental cars, gear and more upon check-in. Extended Stay America calls its breakfast “grab and go” because it’s little more than coffee, instant oatmeal packets, fruit and granola bars. The complimentary Wi-Fi was easy to use and worked fairly well. Extended Stay America in Sandy, Utah is just off of Interstate 15 and located near the South Towne Expo Center, Rio Tinto Stadium, the South Towne Mall, and many restaurants and shopping centers. It is 15-30 minutes’ drive from downtown Salt Lake City, Provo, Thanksgiving Point and several ski resorts, including Snowbird, Alta, Solitude and Brighton. A couple of months ago, I attended a travel blog conference in Fort Lauderdale, Florida where an Extended Stay America turned out to be just as close to the convention center as the official hotel where I stayed. My hotel was more luxurious, but Extended Stay America would have met my needs and saved me a lot of money. When you know better, you do better, and I’m glad I know now about Extended Stay America. Disclosure: My family was hosted by Extended Stay America for the purpose of review. This post contains affiliate links, which do not increase the price you pay, but help us continue to provide free content. As always, all opinions are my own. Check rates and reviews of an Extended Stay America near you! Visit the Extended Stay America website HERE or visit TripAdvisor HERE. We try to stay at places with full kitchens and laundromats too! Much more convenient – you don’t have to pack as much, and not having to go out all the time saves quite a bit of money. I love staying at places with kitchens – this looks like a great one! Great option for families on a budget! This would be good for one of our many soccer tournaments, especially because of the laundry! 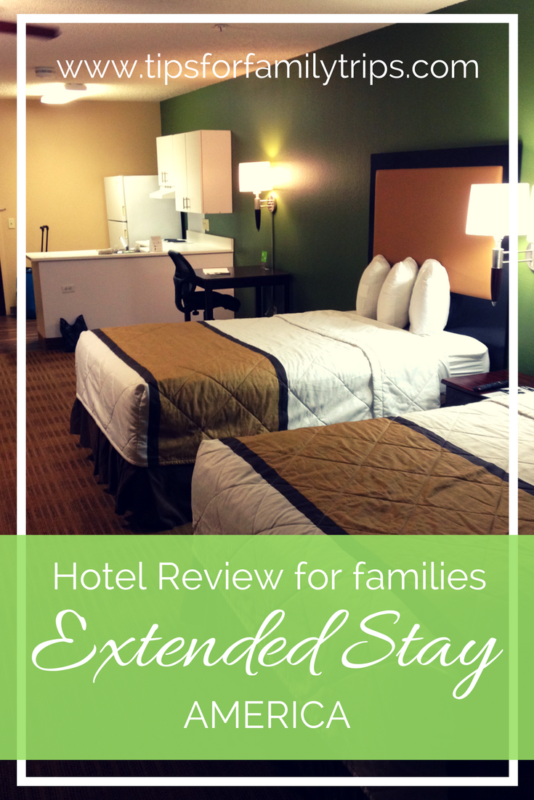 I’ve never stayed at an Extended Stay property – will have to try them out! Any hotel that has a kitchen and comfy beds is OK by me! Love learning about different budget accommodation options that are suitable for families!